"Never fear, Smith is here!" There was some trepidation in the ranks of Lost in Space fans when Fox let it be known that the future of the series on DVD would be determined by the sales of the first season set. With the subsequent announcement of the second season, split onto two, four-disc sets to ease the pain on the pocketbook, devotees of this campy 1960s TV series can breath again, as the Space Family Robinson returns to the screen, more vibrant than ever. By the fall of 1966, Lost in Space was basking in the success of its inaugural season, highly merchandised, and sitting high in the ratings. While his approach on the first season made it highly popular, creator Irwin Allen—who produced a number of popular 1960s TV shows, including Voyage to the Bottom of the Sea, Time Tunnel, and Land of the Giants before he become the 1970s' Master of Disaster with films such as The Poseiden Adventure and The Towering Inferno—was not content to leave things be for the second season, and began retooling his show, with an eye on his successful rivals Batman and Star Trek, which CBS had previously turned down in favor of Lost in Space. The most obvious change to the second season was that it was broadcast in color, bathed in eye-popping reds, ochres, oranges, and greens, which gives the show a whole new feel. The second major change was freeing the Robinsons from their planet and returning them to space, where more untold perils awaited them before they crash land on another alien world. The dramatic overtones that were established in the beginning of the first season made way for a more lighthearted approach, drawing primarily on the comedic skills of Jonathan Harris as the show's antagonist, the evil Dr. Zachary Smith. Originally slated for a guest appearance (he was the first actor to be credited as "Special Guest Star") set to be killed off after a few episodes, his popularity led to a revision in the format, and justifiably so. Whatever you may think of his Dr. Smith, Harris' performances alone are reason to watch the series, perfectly handling the character's comic diversity with flair—one minute scheming some self-serving plot, the next, cowering behind the children in the face of the week's clockwork monster appearance, and Smith's off-the-cuff denigrations towards his robot companion have become a trademark of the show, most of which were created by Harris himself. Bill Mumy (as Will Robinson) also takes the forefront opposite Smith, as his innocent, yet knowledgeable demeanor contrasts with Smith's incompetence as both a scientist and a human being. The robot gets much more character as well, from criticizing Dr. Smith with a few barbs of his own, to feeling despondent or affectionate. Although the rest of the actors are quite comfortable in their roles, they are practically relegated to extras status, with the storylines moving away from featuring the entire family to highlight Dr. Smith's antics. The series hasn't lost its charm in the camp department; its acting on all fronts is still overly dramatic, the plots are usually completely implausible, tending to wander aimlessly from one disaster to another, and the special effects evidence their low-buck origins, and the writing doesn't refrain from a bit of self-mockery now and then. Highlights include Forbidden World, which sees Dr. Smith getting "bombed" after drinking a foreign elixir (you would have thought that Dr. Smith would have figured out that this could be hazardous to his health after his experiences in the first season, but he continues to ignore basic safety precautions in his selfish aims), West of Mars where Harris takes on dual roles when a doppleganger, pursued by a sheriff (played by The Brady Bunch's Allan Melvin) shows up, The Girl from the Green Dimension where the return of Dr. Smith's space siren from Wild Adventure enrages her Viking boyfriend, and Will gets turned into a leprechaun. Perhaps the high (low?) point of this set comes with The Golden Man, where a pair of aliens arrive to wage war on each other. Dr. Smith and the others side with the personable Golden Man, while Penny (Angela Cartwright), in one of her rare showcases, reaches out to the other visitor, whose appearance is far more disturbing. 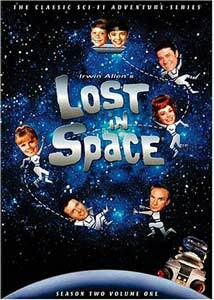 Here we have a classic Lost in Space; there is a moral lesson to be learned, Dr. Smith makes another fatal miscalculation, the kids end up being right, and did I mention the exploding beach balls, christmas lights as barbed wire, or the frog prince? While the writers certainly came up with some interesting stories and characters to play against, they were obviously without a technical advisor, apparent in the many blunders present, from the misuse of the airlock to the ship's physics defying navigation (we'll overlook Smith's cousin (Henry Smith) simply parachuting down onto the planet then miraculously disappearing again in Curse of Cousin Smith). However, there is a lot more effort to develop the characters here, with the crew facing moral dilemmas (such as whether or not to abandon Dr. Smith) on more the one occasion, and the further establishment of the relationships between Dr. Smith and the rest of the crew. Each show still features a cliffhanger, but unlike season one, the recaps in the first set of episodes simply rehash the prior installment's final scene footage, which may have worked when seen on a weekly basis, but does make it a bit redundant when watching episodes back-to-back. While there is an abundance of things to poke fun at, there is little point getting too carried away criticizing the show's shortcomings, as it is the blatently formulaic scripts, goofy monsters, and mind numbing incongruencies that give the show its character, and indeed its lasting appeal. Image Transfer Review: Image quality for this first season two set is fairly good overall, with nice, rich colors (you have to love those 1960s colors! ), and solid black levels, although the later episodes aren't quite as saturated as the first few, looking softer and a little washed out in the fleshtones and murky in the browns. Print source debris is minor, a bit of dust and some fine scratches, and grain structure isn't excessive. There is the odd scene that doesn't quite look as good as the rest, but overall this is an improvement from the first season. Audio Transfer Review: Mono audio is available in English, Spanish and French. The soundtrack is clear, well balanced and free of any techniclal deficiencies such as excess sibilance or distortion. Extras Review: Although the second volume is slated to include a few goodies, apart from the 12 chapter stops per episode found here, any other extras have been lost in space. This set is again comes with a box housing the four thinpak cases, each with a brief episode guide on the back, and chapter listing inside. Fans should be delighted that Fox has chosen to continue the DVD releases of this campy 1960s series. The second season of Lost in Space continues the adventure, keeping Jonathan Harris in the spotlight.